One of the additional features on mikrotik is Emailing techniques. 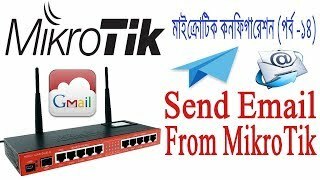 Mikrotik routers, are equipped with the ability to send emails along with its attachments that can be used to send backups of Mikrotik configuration periodically, monitor and monitor network conditions up or down, etc. 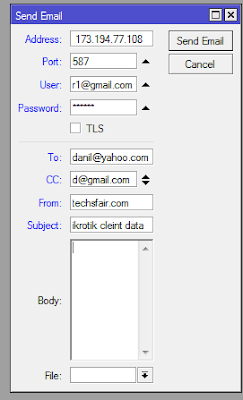 Before we discuss the use of advanced email feature, it helps us learn Mikrotik from its basic first about how to Set Email and Send Email in Mikrotik RouterOS. For more easily we use Mikrotik use Winbox only. For the email used to send we use Gmail only, so please you set up his Gmail account. 3. Click Apply -> OK.
6. Enter the email address you want to email in “To”. Fill out the “CC” if necessary. 7. Fill “From, Subject, and Body” as you see fit. 8. You can also attach a file (attachment) in the “File” option. 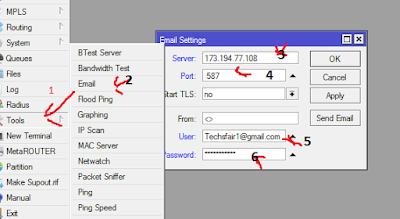 Hopefully this tutorial on Mikrotik Networking, How to Setup Email and Send Email on Mikrotik RouterOS will help you when doing your configurations. 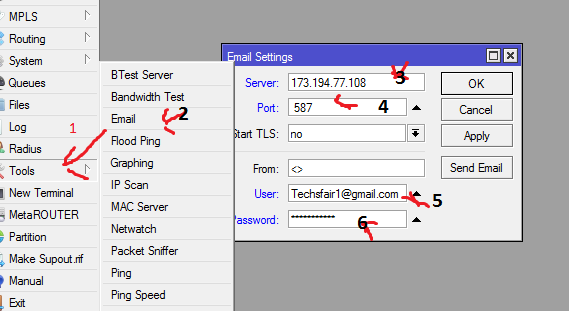 With this I strongly believe that in the future we can take advantage of this Email function to monitor network conditions, backup mikrotik configuration periodically via email, etc. ← How to Disable Message Button on Facebook Timeline.